Digestive enzymes are essential to the body's absorption and full use of food. The capacity of the body to make enzymes diminishes with age, and therefore the efficiency of digestion declines. 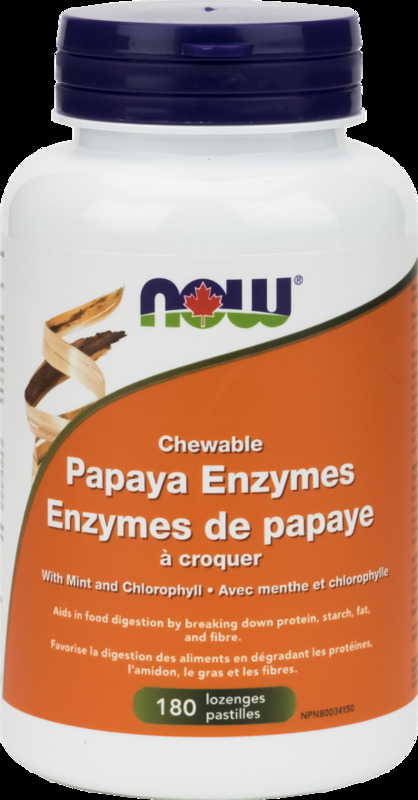 NOW® Papaya Enzyme Lozenges have a refreshing taste and support digestion when taken after meals. Our tablets are made from whole, unripe, spray-dried Papaya powder, and contain 40 mg of Papaya per Lozenge. In addition, Protease, Lipase and Cellulase have been included for a full spectrum of enzymatic activity. Non-Medicinal ingredients: Sorbitol, Mannitol, Stearic acid (vegetable source), Magnesium stearate (vegetable source), Silica, Peppermint Powder, Peppermint Oil and Sodium Copper Chlorophyllin. This lozenge may also be useful as a breath freshener. Adult Dosage: Chew or dissolve 2 lozenges 3 times daily in the mouth. Take with food/meals. For prolonged use, consult a health care practitioner. Consult a health care practitioner prior to use if you are pregnant or breastfeeding, if you have diabetes or a gastrointestinal lesion/ulcer, if you are taking anticoagulant/blood thinners or an anti-inflammatory, if you are having surgery, or if you have allergy to latex or fruits (such as avocado, banana, chestnut, passion fruit, fig, melon, mango, kiwi, pineapple, peach, and tomato). Hypersensitivity/allergy has been known to occur; in which case, discontinue use. Nausea, vomiting, and diarrhoea have been known to occur, in which case discontinue use (and consult a health care practitioner).